In emerging Europe, we’ve seen how pension spending has increased from 7½ to 9 percent of GDP over the past two decades. Spending also increased rapidly in other emerging economies—albeit from much lower levels—going from 2 to 3 percent of GDP over the same period. It seems the relatively low spending in emerging economies outside Europe reflects relatively low coverage (generally only those in the formal sector are eligible) and younger populations. 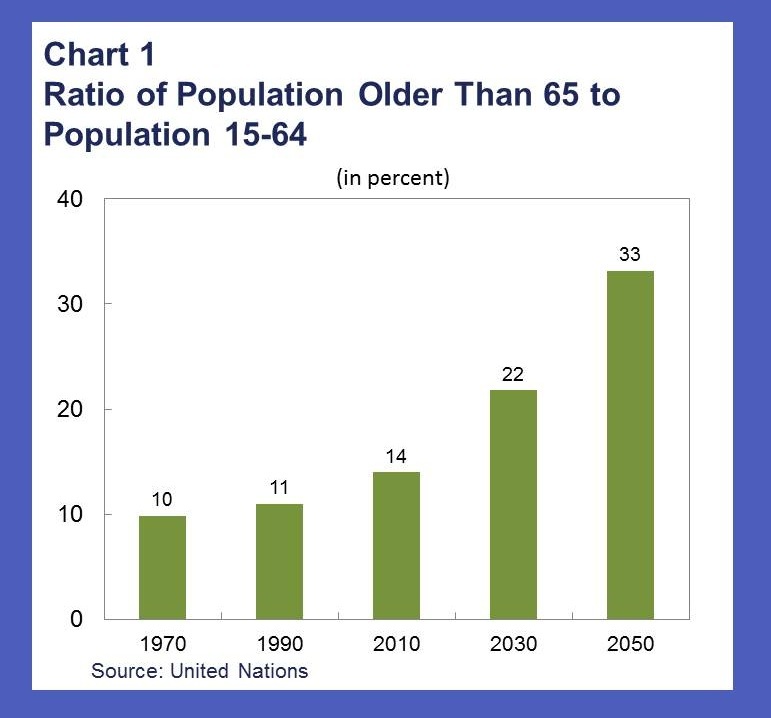 Populations are aging rapidly in the emerging economies. As illustrated in Chart 1, a rather grim picture is developing where we see that the ratio of elderly to working population will more than double in the next four decades. In the future, there will be many more retirees consuming what fewer workers will produce. So taking this into account, Chart 2 shows the projected increase in pension spending over the next 20 years is about 1 percentage point of GDP. And these projections assume no expansion of coverage beyond current levels. Several countries—Bulgaria, Chile, Estonia, Hungary, and Poland—have enacted reforms that will cut public pension spending over the next 20 years. In other countries—particularly in Asia, we see smaller projected spending increases due to lower coverage and spending. For five emerging market economies the fiscal burden will be a lot higher (more than 2 percentage points of GDP). In many emerging economies a large share of the elderly population is poor—in part because of inadequate pension coverage. Expanding existing pension systems to improve coverage would be costly. For example, increasing coverage from 26 to 34 percent in Asia would increase spending by 1 percentage points of GDP. Similarly, in other emerging economies outside of Europe, increasing coverage from 64 to 73 percent would increase spending by 1 percentage point of GDP. How can pension reform help? There is plenty countries can do to address burgeoning demographic pressures to public pension systems. The range of measures includes raising retirement ages, cutting pension benefits, and increasing revenues. May be easier for the public to understand than cutting pensions or increasing contributions. One possible strategy would be to equalize retirement ages of men and women—in many emerging economies the statutory retirement ages of women remain lower than those of men. For the emerging economies with low pension coverage, current systems—which are often generous but cover only a small portion of the population—should be reformed prior to expanding coverage. In addition, countries with very low coverage rates could consider “social pensions” that provide a noncontributory flat pension aimed at poverty reduction. For countries that have substantial pension coverage, such as in Emerging Europe, continued reforms are needed to contain the growth in public pension spending. . They also need to be cautious in diverting additional contributions from public to private systems, which could make the financing of the deficit more challenging in the short run. Many emerging economies will need to expand their pension systems to reduce poverty among the elderly. Well-designed reforms can help countries meet this objective without going broke. 2 Responses to "Going Broke? Why Pension Reforms Are Needed in Emerging Economies"
I live in Canada. Pensions and benefits have all but disappeared in the private sector. 70% of the workforce have no employer based pension. 20% work for government and most of them have very generous pensions which are 50% or more funded by taxpayers. These are primarily defined benefit plans guaranteeing 60 to 70% of average top 5 earning years after about 30 years. It's mandatory for all workers to contribute to the Canada Pension Plan. Last year the average benefit paid $6144/year. The maximum benefit payable is $12,000/year and would only be payable to those who made maximum contributions for 33 years. This is almost impossible because CPP, unlike government pensions, is based on career earnings. A reduced pension is available at 60, full benefits 65, and there's a bonus available for every year worked between 65 and 70. There's going to be lots of poverty stricken baby boomers. Most of us are responsible for funding our own retirements and nobody bails out our market losses as is done for public sector workers in taxpayer subsidized and guaranteed pensions. Interesting post. It is important to define what kind of pension coverage are we talking about. 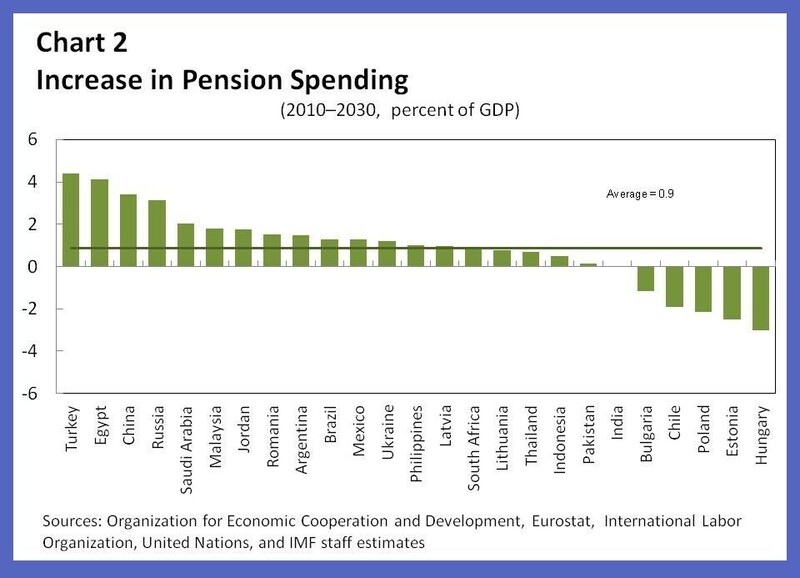 Obviously, social pensions, that are more focused on "old age coverage", could have enormous impact on fiscal budgets, particularly when longevity is increasing in emerging markets. Besides, we cannot underestimate the effect of social pensions on public spending from the dynamic of the political economy and weak institutions. On the other hand, public policies pursuing to increase "labor coverage", or pension participation, could help to reduce public spending, if that means more people contributing to the systems. Of course, it will depend on how well adjusted are PAYG parameters.